Pupils at an East Riding secondary school will have more opportunities available to them after a leading forecourt operator donated more than £2,500 to reach their target for a new minibus. Cottingham High School and Sixth Form College needed to raise £25,500 to cover the cost of the 17 seat vehicle and received donations and support from the local community, including the Parish Council, businesses, parents, students and staff during the 18-month fundraising drive. But the school fell £2,697.89 short of their target and Sewell on the go, which has a forecourt and convenience store in Cottingham, stepped in to help reach the final amount, as well as donating £600 a year to help towards fuel costs or receive discount on items sold in store. Scott Ratheram, former Headteacher at the school, led the project, which has 870 pupils aged 11 to 18. New Headteacher Loz Wilson will officially begin his role in September. Scott said: “We are incredibly grateful. On behalf of the school governors, the Parent/Staff Association (PSA) and students, I would like to thank Patrick and Paul Sewell, and Sewell on the go, for their fantastic support in pledging the final amount required to purchase our school minibus. “This very generous donation, along with the yearly fuel allowance, means we are now able to offer an even greater number of exciting enrichment opportunities for all our students. This will especially benefit our sports teams and enable us to support smaller team events in the future. “It will enable us to make a real difference and offer some opportunities which students will remember for a lifetime. Sewell Group Managing Director Paul Sewell and his son, Patrick, Managing Director of Sewell on the go, attended Cottingham High School, as did several Sewell Group staff and their families. Scott said: “Paul came back to give a very inspiring talk to our students and we were overwhelmed by the offer of support towards our minibus. Meeting the target meant we could kick-start things in the New Year and it created real sense of achievement to get over the line. “The connection the Sewell family has with Cottingham High School and the community is really fitting. 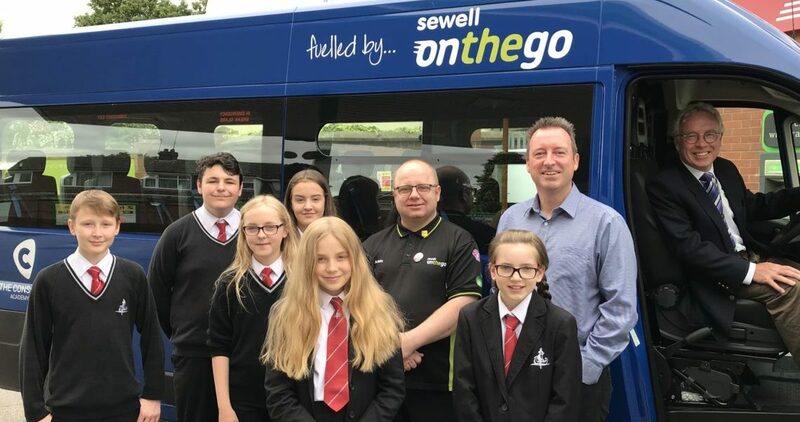 Sewell on the go Cottingham is one of 13 Sewell on the go forecourts and convenience stores across Hull and the East Riding and staff will be able to fuel the new minibus at any of these locations. Businesses including Co-op, Swift Caravans and the James Reckitt charity also donated towards the minibus, as did the Matthew Good Foundation. Students who are involved in rugby, football, athletics, netball and other sports will be among those who benefit most from the minibus as they travel to interschool competitions and athletics meetings across the region. Patrick said he is delighted the business could give back and make a difference to the students. He said: “We are incredibly pleased and proud to help the school over the line with their fundraising and reach their target. Our connections to the school and the Cottingham community are long standing and it’s wonderful to be able to support the next generation.